Whistleblowers and their investigative exposés have a long and storied history in America dating back to journalist Upton Sinclair's 1906 book The Jungle, which uncovered atrocious conditions inside America's meatpacking plants that shocked the nation’s conscious. Sinclair’s whistleblowing led directly to the passage of the federal Meat Inspection Act, the Pure Food and Drug Act, and the eventual formation of the federal Food and Drug Administration (FDA). A broad spectrum of groups representing these interests and more have spoken out against ag-gag laws, opposing their introduction across the country. Ag-gag laws are also troublesome because they do not reflect the public's will. Polls consistently show that the majority of Americans favor humane treatment of farm animals. A 2012 poll conducted for ASPCA by Lake Research revealed that 94% of the general American public agrees that "from every step of their lives on a farm—from birth to slaughter—farm animals should be treated in a way that inflicts the least amount of pain and suffering possible." The same poll also revealed that 71% of American adults support undercover investigative efforts to expose farm animal abuse on industrial farms, and that 64% oppose making such investigations illegal. It is important to let our state legislators know that we do not support the passage of ag-gag bills or any other legislation that would allow animal abuse to be covered up. To take action and spread the word, visit aspca.org/OpenTheBarns. Over the past several years we’ve defeated ag-gag bills in more than 20 states. 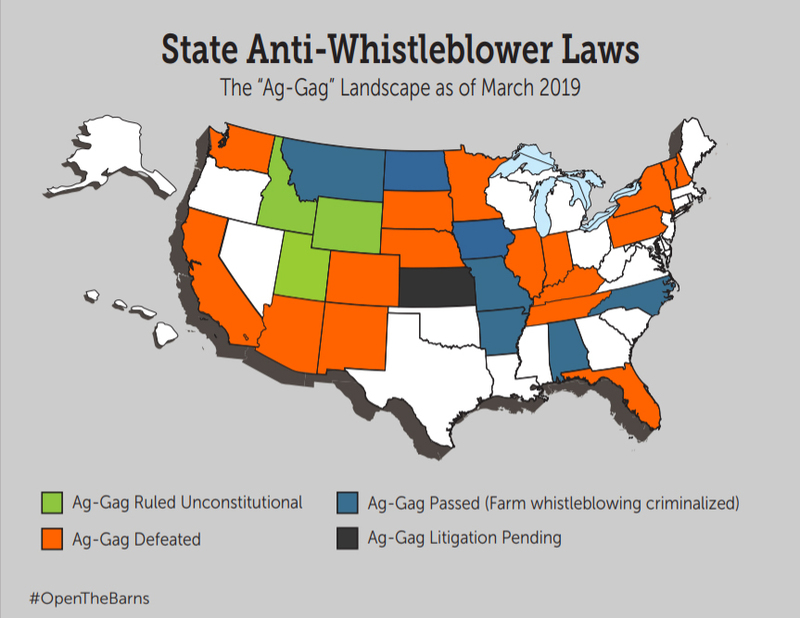 Despite our best efforts, a few states have enacted anti-whistleblower bills into law and a handful of other states have had ag-gag-type laws since the 1990s. As more and more ag-gag laws are found unconstitutional, states are introducing different bills to restrict access to/observation of farms, such as bans on the use of drone photography over concentrated animal feeding operations (CAFOs). Take a look below to see if your state has introduced an ag-gag bill or any other kind of restriction on factory farm investigations, and take action! Alabama – Passed an ag-gag law in 2002. It makes it illegal to obtain access to property “by false pretenses” and to possess records obtained by deception. Arizona – Introduced H.B. 2587 in 2014. Failed. Arkansas – Introduced legislation in 2013. Failed. Passed an ag-gag law in 2017 that created a civil cause of action allowing businesses to sue whistleblowers who expose abuses happening on their farms/businesses. California – Introduced legislation in 2013. Failed. Colorado – Introduced S. 42 in 2015 to require reporting of cruelty within 48 hours. This "quick-reporting" bill would prevent the collection of adequate evidence to show patterns of abuse, neglect or abandonment, potentially hindering prosecution of abusers. Bill tabled in February by its sponsor. Florida – Introduced legislation in 2012. Failed. Idaho – Passed an ag-gag law in 2014, which in August 2015 was struck down by the Idaho District Court as unconstitutional. Illinois – Introduced legislation in 2012. Failed. Indiana – Introduced legislation in 2012, 2013 and 2014. Bills failed in 2012 and 2013. Introduced S.B. 101 in 2014 which was later stripped of ag-gag-type provisions. Iowa – Passed an ag-gag law in March 2012 that criminalizes providing false information on an employment application with the intent to record images. In January 2019, the U.S. District Court of Southern District of Iowa struck down the law as unconstitutional. Passed a new ag-gag law in March 2019 that criminalizes using deception to gain access to an agricultural production facility with the intent to cause harm to the business. Kansas – Passed the Farm Animal and Field Crop and Research Facilities Protection Act in 1990. It criminalizes “enter(ing) an animal facility to take pictures by photograph, video camera or by any other means” with the intent of causing harm to the enterprise. Lawsuit filed in December 2018 challenging constitutionality of law. Kentucky – Added an ag-gag provision to a pro-animal bill in 2014. Bill died. Minnesota – Introduced legislation in 2011 and 2012. Failed. Missouri – Passed an ag-gag law in July 2012. Mandates that evidence of animal abuse must be turned over to law enforcement within 24 hours, preventing the collection of adequate evidence to show patterns of abuse, neglect or abandonment, and potentially hindering prosecution of abusers. Montana – Passed an ag-gag law in 1991. It criminalizes “entering an animal facility with the intent to commit a prohibited act, entering an animal facility to take pictures by photograph, video camera, or other means with the intent to commit criminal defamation, and entering an animal facility if the person knows entry is forbidden.” Introduced a quick-reporting bill in 2015 providing that "a person who knowingly fails to report evidence of cruelty to animals at an animal facility within 24 hours commits the offense of cruelty to animals." The ASPCA opposes quick-reporting bills. Bill died. Nebraska – Introduced legislation in 2012 and 2013. Failed. New Hampshire – Introduced legislation in 2013. Failed. Reintroduced H.B. 110 in 2014. Bill died. New Mexico – Introduced legislation in 2013. Failed. Introduced a quick-reporting bill in 2015 to make failure to turn over evidence of animal abuse within 24 hours of collection a misdemeanor. Failed. Also introduced S.B. 167 in 2017 to make using drones to conduct surveillance of a farm illegal. Failed. New York – Introduced legislation in 2011 and 2012. Failed. North Carolina – Introduced legislation in 2013 and 2014. Failed. In 2015, ag-gag bill H.B. 405 passed and was vetoed by Governor McCrory, but the NC House and Senate overturned the veto. H.B. 405 went into effect on January 1, 2016. The law prohibits anyone from gaining access to the non-public area of their employer's property for the purpose of making secret recordings or removing data or other material. The law creates a civil cause of action, allowing a business to sue for damages. In February 2016, the ASPCA joined a lawsuit challenging the constitutionality of H.B. 405. Pennsylvania – Introduced legislation in 2013. Failed. Tennessee – Introduced legislation in 2013, which was passed by Legislature but vetoed by Governor. Introduced legislation again in 2014, which failed. H.B. 1838, introduced in January 2016, prohibiting anyone from gaining access to the non-public area of their employer's property for the purpose of making secret recordings or removing data or other material. Failed. Texas – Passed H.B. 1643 in June 2017, which makes it illegal to use a drone to take photos over a concentrated animal feeding operation (CAFO). Utah – Passed an ag-gag law in March 2012 criminalizing numerous actions related to accessing and recording agricultural operations. In July 2017, the U.S. District Court of Utah struck down the law as unconstitutional. Vermont – Introduced legislation in 2013. Failed. Washington – Introduced legislation in 2015 to create the crime of “interference with agriculture production” and classifies it as a gross misdemeanor with maximum penalties of one year in jail, a $5,000 fine, or both. West Virginia – Introduced legislation in 2019 to prohibit access to “nonpublic areas” for reasons other than intent to perform authorized work, including capturing photographs and videos or removing other data or documents. The bill would create a civil cause of action, allowing businesses to sue for damages. Wyoming – Introduced legislation in 2013, which failed. Introduced S.F. 12 in 2015 to criminalize collection of "resource data" (including photos and video) on private land and prohibit it from being used as evidence in criminal trials. Governor Mead signed S.F. 12 into law in March. A 2016 revision to this law seems to indicate that it is not targeting animal cruelty investigations. In September 2017, the 10th Circuit Court of Appeals struck down the law as unconstitutional. Other states have related statutes that are sometimes called "eco-terrorism" or "animal enterprise interference" laws. View this chart to see if your state currently has any kind of farm-related, anti-whistleblower law on the books. Join the ASPCA Advocacy Brigade to stay up to date on ways you can help! You can also enter your zip code here to look up your governor and state legislators and contact them to ask that they vote against these dangerous bills. PLEASE NOTE: When you click on the link above, you will be accessing content on a website owned and/or maintained by a third party. The legal information on the MSUCL website is researched and provided by MSUCL, not by the ASPCA, and by clicking the link above, you acknowledge that you understand that this information is not being provided by the ASPCA. The information provided is general in nature and is not intended as legal advice. If you have legal questions or concerns, you are advised to contact appropriate counsel.